Some of you may already know where I'm going with this. Several years ago, Helen & Marc Younger and Dan Hirsch published an excellent guide to Dr. Seuss first editions - First Editions of Dr. Seuss Books. 2002. Custom Communications. ISBN: 1892168081. At the time of this writing, the cheapest copy I could find online is offered for $175.00. Not bad for a 200-page book published only four years ago. Not bad, that is, if you're on the selling end of it. If you're a struggling bookseller looking for solid information that's hard to come by anywhere else, however, it likely won't fit into your budget. Contrast this to the Children's Picturebook Price Guide, which can be purchased new at Wal-Mart for $16.36. The Zielinski's guide isn't by any means an exhaustive treatise on Dr. Seuss first edition identification, but there are over four pages of discussion that detail the pertinent issue points for titles both written and illustrated by Dr. Seuss (Theodor Seuss Geisel) and make some organizational sense of what can be a maddeningly complex process in this niche. To their credit, the Zielinski's strongly recommend the Younger/Hirsch guide for serious collectors. Included in the first eight lists are titles, illustrators and prices, most of which are valued at well over $100 - in all, 140 titles that should be in any scouting book or at the very least committed to memory. The last list - Most Valuable Illustrators - interested me especially. First, I did what I do when I encounter any list like this: I took a test, putting a check mark next to, in this case, every illustrator I knew. Sad to say, I was deeply humbled; many more names were left unchecked than not, especially among those occupying spots 60-100. I'm always grateful for moments like this because they remind me that my education as a bookseller is far from over. All of these lists will point you to value in picturebooks and are worth far more than the purchase price of the guide. Many of the ideas discussed, as you might expect, have general applicability to bookselling, and beginning booksellers especially would benefit from reading the front matter in this book. 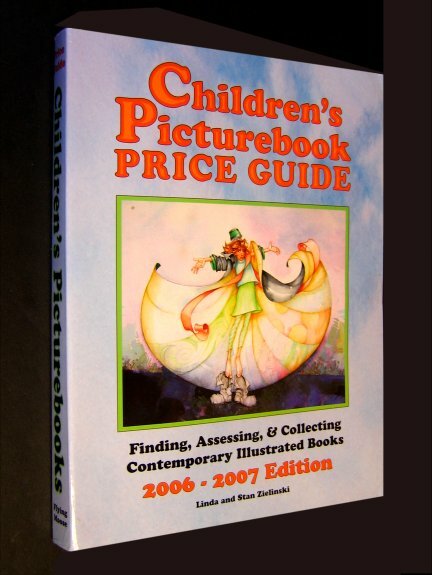 The price guide itself, which comprises the bulk of this large-format, 479-page book, is arranged by illustrator - a sensible acknowledgment that picturebook collector interest is focused primarily on illustrators and secondarily on authors and/or titles. The year of publication, title, condition (VG-, VG, VG+ and Fine), author, awards, and publisher are noted for each entry (over 23,000 of them), and page layout is friendly to the eye: It almost seems to encourage the reader's eye to alight on high spots. As is the case with any price guide, prices quoted have begun to obsolesce as we speak, and their utility will necessarily and quickly narrow to a less edgy compilation of prices relative to other prices - that is, they will remain somewhat useful for comparing one title to others. Also note that any attempt to valuate collectible books is fraught with innumerable uncertainties; and, as the Ahearn's have asserted more than once, pricing is an art, not a science. Some of the Children's Picturebook Price Guide prices, therefore, are likely to strike you as ambitious, others spot on, and still others overly modest. If you liked this article, Digg it!